Windows 95 was the fourth major release of Microsoft’s graphical operating system, launched nearly 10 years after Windows 1.0 and 20 years before today’s Windows 10. Since the Apple Macintosh popularised the idea of graphic interfaces in 1984, Microsoft had been trying to catch up. The original first two versions of Windows were little more than crude interfaces running on top of DOS, but Windows 3.0 in 1990 and especially Windows 3.1 in 1991 had proven to be very successful, even if they weren’t as sophisticated as Apple’s offerings. 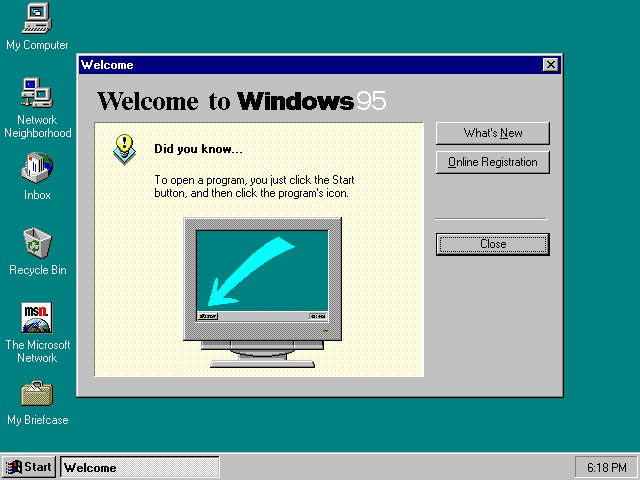 Windows 95 was still underpinned by the ancient DOS architecture, but the immediately obvious thing was a completely different user interface centred on the somewhat infamous “Start” button that lasted all the way up to Windows 8. But Windows 95 also introduced better multitasking, plug-and-play, better disk support, properly integrated network and superior memory management. By 1995 rivals Apple had System 7 (later Mac OS 7), but although it was superior in many ways to Windows, it was much more expensive to buy a Mac than a Windows PC. A combination of stiff competition from Microsoft and some very poor business decisions from Apple nearly drove Apple at of business. It wasn’t the only competition for Microsoft. A few years previously, Microsoft had broken up with long-time partners IBM. At the time of the break-up, Microsoft and IBM had been working on a revision of OS/2 which was meant to be the “next generation” of Windows. By 1995, IBM had started eating into the Windows market with OS/2 2.0 followed by OS/2 3.0 (known as “Warp”). Although OS/2 was in many ways better than Windows, it was essentially an IBM-only product and you would have to buy an IBM personal computer to run it on. And because IBM’s computers were expensive, most people bought something else… and that something else would be running Windows 95. 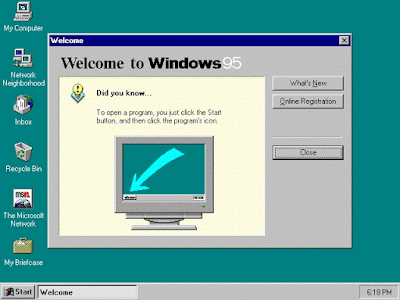 Windows 95 was also the first version of Windows to offer Internet Explorer, although Netscape Navigator (which eventually evolved into Firefox) had been available for some time before that. Integrated TCP/IP networking meant that Windows 95 machines could access the Internet, such as it was 20 years ago. 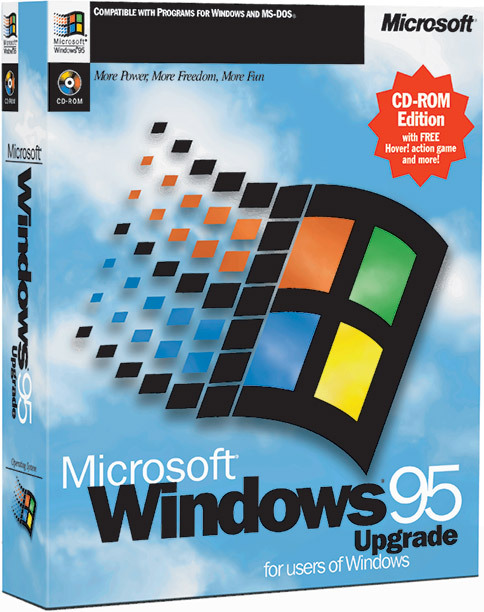 Later versions of Windows 95 added USB support, and the operating system had a major overhaul in 1998 with the highly successful Windows 98 environment. However, the final revision of this operating system line was Windows Millennium Edition (“ME”) launched in 2000, which was buggy and unpopular. Even in 1995, the writing was on the walls for Windows 95 and its successors. Microsoft had launched Windows NT 3.1 in 1993, followed by versions 3.5 and 3.51 which shared the clunky interface of Windows 3.1 on top, but underneath NT was a much more modern and extremely capable operating system. Windows NT 4.0 in 1996 added a Windows 95 style interface, and eventually after several revisions it evolved into Windows 10, designed to a single OS that can run on PCs, smartphones and tablets. Almost every version of Windows in user today runs on the NT core, so in the long term Windows 95 itself was a dead-end. However, it cemented Microsoft’s dominance of the PC industry and left them in a position that seemed unassailable until the rise of tablets and smartphones… many of which were built by the same Apple that Microsoft nearly killed off in the nineties.